Call to schedule an appointment for hurricane engineering or a windstorm inspection. 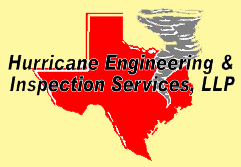 Hurricane Engineering and Inspection Services, LLP is a growing company located in Hitchcock, Texas. Hitchcock is centrally located to the coastal communities serving Galveston, Jefferson, Brazoria, Matagorda and Chambers Counties. Our engineers are knowledgeable and have passed additional stringent testing by the Texas Department of Insurance. In addition, members of professional organizations ASCE, TSPE, FPA and engineers performance review committees as well community involvement including Chamber of Commerce Membership, Gulf Coast Big Brothers & Big Sisters and Rotary Club. Our engineers have more than 25 years of combined engineering and inspection experience. The office staff are friendly and quickly establish rapport with our customers. They work with each customer on a personal level to establish their needs and communicate effectively between customers, inspectors and engineers. Hurricane Engineering & Inspection Services, LLP mission is to provide our clients with the highest quality residential and commercial inspections and engineering services. We will be upfront communicators with our clients and staff. We will operate in integrity with ourselves and our customers.